When I arrived at the University of California, Santa Barbara Chem Lawn pitch late last Sunday evening, I was met with nothing close to the spectacle that I expected there to be–no quaffles, no beaters, no goals–nothing except for the ominous fog that hung low over the grassy field. I don’t know what I was expecting; a Santa Barbara Blacktips practice could obviously not feature the same grandeur as a World Cup. Nonetheless, an excited shiver shook my spine as I walked out to the center of the pitch to await the coming onslaught. But despite minutes of stretching, days of mental preparation, and years of “Harry Potter” reading, I was still not ready for what I was getting myself into. Quidditch was obviously first introduced by J.K. Rowling, but this current real-life, land-based incarnation was developed at Middlebury College in 2005, and has since grown to about 500 separate teams in North America and Europe. They have their own governing body: the International Quidditch Association organizes the World Cup, in which teams from around the world come to compete to be named World Champion. When practice first began, I quickly found that the game play was intense, to say the least. A back and forth, full contact affair that is played at sprint at nearly all times, quidditch is best described as a fantastic cross between ultimate Frisbee, lacrosse, and field hockey, and is definitely not the fun and relaxing romp through the “Harry Potter” universe that I expected it to be. There is the occasional joke on the origin of the sport, but when the brooms go up, so goes the intensity. Evan Bell, a Santa Barbara City College student and the Blacktips’ Oliver Wood, first formed the Santa Barbara Blacktips a little less than two years ago. 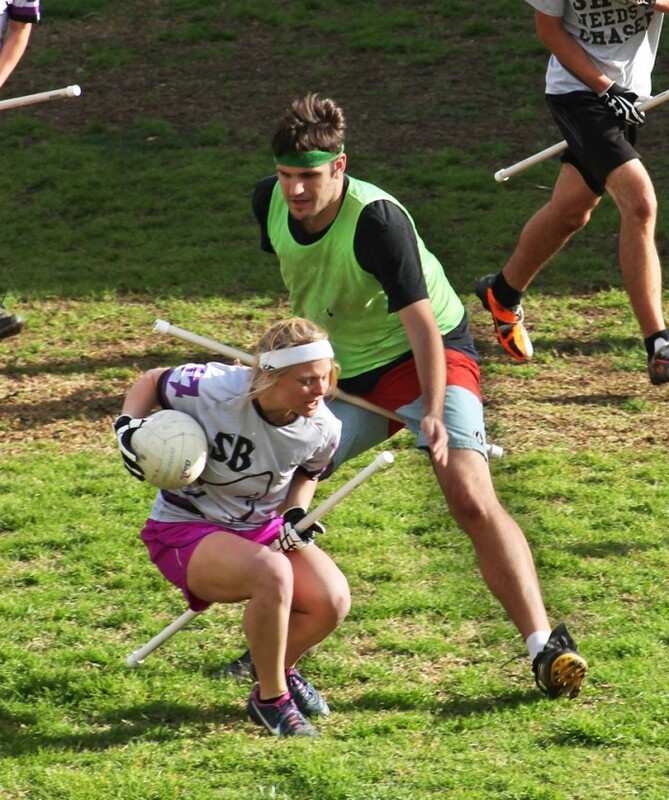 Bell stated that quidditch players are split between serious athletes and serious “Potterheads.” The Santa Barbara Blacktips–the local co-ed team made up of players from UCSB, SBCC, and the surrounding community–offers up a thoroughly entertaining mix of fun and sport. But while some teams might be more heavily skewed toward fans of the series, to be a competitive team, one must have a great amount of athleticism, teamwork, and dedication to the sport it truly is. The Blacktips are currently ranked fifth in the West Region, and have recently qualified for the 2014 World Cup in Myrtle Beach, South Carolina, but it is going to take more than felix felicis to get there. Simply getting to the World Cup is going to be a challenge; the Blacktips are not affiliated with UCSB, and are forced to depend on private donations to fund their trip to the Championship. To donate to their cause, visit their Facebook page, and keep an eye out for future fundraisers. As for playing, if you are interested, the Blacktips practice at the Chem Lawn field on Sundays from 2 to 4 p.m., and Monday nights from 7 to 9 p.m. Brooms up!